Although keeping Mom and Dad at home for as long as possible involves some work, preserving their independence — while easing your mind about what happens when you can’t be there — is worth it. Keeping your parents at home means mitigating the risk of falls. Millions of people 65 and older fall every year and falling once doubles an individual's chances of falling again, per recent CDC statistics. Removing fall risks is the best first step to making Mom and Dad’s home safe — and keeping them out of a hospital. Because falls are so closely connected to balance and vision issues, fall-proofing an older adult’s home should be focused accordingly. Pay attention to steps and stairs. If your parent has a walker, cane, wheelchair or other mobility aids, going up and down the stairs may no longer be feasible. You may need to consider a wheelchair ramp, or to create a no-step threshold (either up or down) entry into a room, or from outside the house. But these kinds of modifications are a little more involved, especially in an older home. Before doing construction, find ways to move your parents to one-level living. Do they have a guest room and bathroom on the first floor? Suggest moving from the upstairs master bedroom. No spare room on the ground floor? You may want to get creative with making a bedroom in a living or family room space. If either one of your parents is still able to use the stairs, apply non-skid step treads, tape or stickers to the steps for extra stability. Mark thresholds and transitions with colored tape. Strong color contrasts make it easier for aging eyes to focus. Purchase a roll of colored duct tape and mark the entrances to rooms where the flooring goes from wood to carpet or tile to linoleum. If there is a step-down or step up into a room, mark it with brightly colored tape to draw the eye and prompt your loved one's careful navigation. Remove clutter and trip hazards. Floor lamps should be positioned in a corner, so the wires are not on a walking path. Throw rugs of any size should be removed from the home because they can be a trip hazard because the patterns can confuse the eyes and brain for an older adult with dementia or a depth perception issue, and because throw rugs are nearly impossible to secure. Rearrange furniture and remove clutter in corners and hallways to ensure a wide, clear path in the home’s high traffic areas. Once you've identified the most significant fall risks, consider these practical tips and tricks to make it possible for your senior parents to stay at home for as long as possible. Your goal is to make their home safe and sustainable, and to do that, you'll need to improve efficiencies while eliminating hazards. Good lighting makes a world of difference when it comes to the safer navigation of hallways and the home in general. Line the hallway with motion-sensor nightlights if you know that Mom or Dad uses the bathroom at night. Check light bulbs throughout the house and even consider replacing current ones with a higher wattage. Grab bars aren’t just for the bathroom. Place them wherever your parents need an anchor while walking or moving about a room, for example, near a couch or chair Dad often sits on in the living room, in the hallway and perhaps even the kitchen. Finding comfortable, EZ-on and supportive footwear for older adults can be a challenge for many health-related reasons (swelling, circulation problems, etc. ), but poorly fitting and "slippery-soled" shoes or slippers can quickly lead to a fall or other injury. Take note of what your parents wear around the house, and try to determine if they’re getting the support they need — as well as a non-skid sole for traction. Ask your parents which chairs they use the most often, and check how sturdy they are — or, how easy they are to use. Recliners, while comfortable, are typically very difficult for older adults with balance issues or diminished muscle strength to rise from, and if they’re positioned too low, sitting down can also be a challenge. When you’re visiting, take note of how they get into/out of chairs. Do they grab onto a TV table nearby? Does your Dad assist your Mom, which could also pose a fall risk for him? If your parents make coffee every morning, are they reaching for their favorite mugs on a high shelf? Take stock of the items they use and consume daily (in the bathroom medicine cabinet too) and move these things to countertops or shelves that are clearly visible and easily accessible. Simplify your parents’ organization by color-coding their keys. Use rubber tabs that fit over the top of the key, or by using nail polish or paint markers. And remember a tip from above: if they often return home later in the day, outdoor lighting lining the path to the front door and next to the front door (motion-activated, on a timer, or solar-powered) is essential. For arthritic hands or a parent with Parkinson’s, for example, wrap hard-to-hold items (like the remote or a drinking glass) with rubber bands for better grip. You can also wrap rubber bands around a cutting board to keep it from slipping on the counter, or on soap dispensers for easier release. A“grabber" is an excellent tool for many daily to-dos, both inside and outside the home. Some grabbers are specially designed for use in the garden, so if your mom or dad loves getting outside and can still do so safely, consider using this item to ease the challenge of a weaker grasp. Some use grabbers to assist in putting on socks, a simple task that becomes quickly frustrating as vision, coordination, reach and fine motor skills diminish. These safety and efficiency accommodations are all about empowering independence. Your parents want to stay home, and the more they can do for themselves there, the better. And according to the 2017 Genworth cost of care survey, the national median cost of a semi-private room in a nursing home is $7,148 a month; a private room is $8,121, so staying home is also a cost-effective solution. But you are currently their primary support system, and your comfort level with your parents staying home is equally important. The above methods to help your parent stay home, while useful, can be exhausting, especially if you take the precautions and Mom or Dad happen to fall or injure themselves anyways. It may be worth working with a professional caregiver to implement these ideas and any other home modifications he or she may recommend. 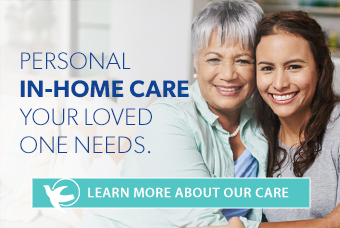 A professional caregiver can also work with you to meet your parents’ needs for companionship when you have to take the kids to soccer practice, attend a board meeting or just have time for self-care. Caring for your aging parents isn’t easy. But did you know there are other community resources available to assist you in your caregiving journey? Check out this top 10 list.